Buy the freshest mussels possible; choose only those that are tightly closed and smell briny and like the ocean. When you get home, fill a bowl with ice and lay a clean kitchen towel over the ice. If the mussels are in a mesh bag, simply lay the bag over the ice. If they came in a plastic bag, remove the mussels and arrange them over the cold towel. 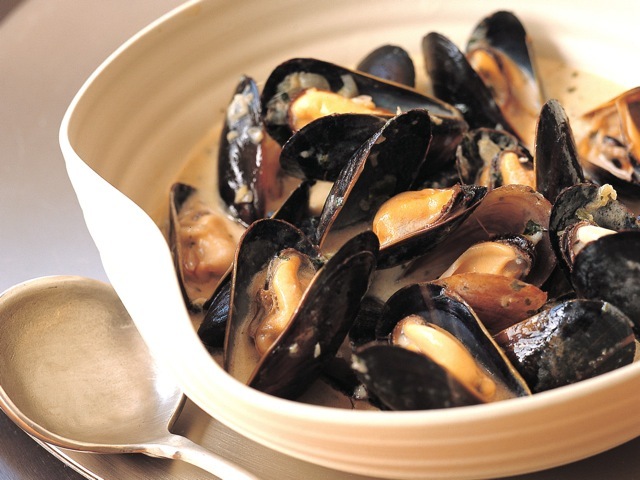 Place this bowl in the refrigerator until you are ready to cook the mussels. Scrub the mussels well. Pull off any beards and discard any mussels that are not tightly closed. Using a blender or food processor, grind the tomato, cilantro, mint, ginger, and chiles to a fine, smooth paste. You may add a few tablespoons of water if needed. Heat the oil in a medium wok or cast-iron skillet over medium heat and sauté the onion until golden. Add the green curry paste and sauté until the curry smells cooked and fragrant, 4 to 5 minutes. Add the coconut milk and salt to taste and bring to a boil. Add the mussels and reduce the heat to low. Toss well, cover, and cook until all the mussels open, about 5 minutes. Discard any that have not opened. Serve hot with rice or French bread. Culinate editor's note: If you don't have fresh herbs, chiles, and tomatoes on hand, make a simple curry using just onion, ginger, garlic, chile flakes, and the curry powder of your choice sautéed in oil or ghee, then simmered in 1 cup coconut milk and 1/2 cup seafood stock. Add the mussels at the end of the simmering time and cook just until the mussels have opened, then serve over rice or with bread.